Mount Buller is Melbournians winter epitome. 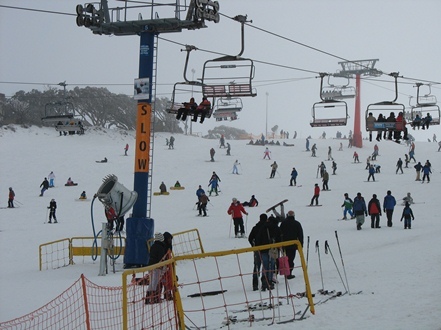 The right mix of snow, fun and sport makes Mt Buller a never miss destination. Mount Buller is an easy three hour drive from Melbourne. It is important that you prepare for your trip with the right mix of clothing to stay warm and dry. It may not be advisable to buy everything for a once in a year visit to a snow region. Ensure that you dress in layers with waterproof clothing outside. Water proof clothing and boots can be rented from Mansfield or from Mount Buller Village. There are many shops in suburbs of Melbourne renting these items. A word of caution: I personally don’t recommend renting from the main shop in Mansfield, as their prices; at best can be described as rip off rates. At the beginning of the winter Aldi runs sales for snow clothing. They are of very good quality and cheaper than the rental rates .Most of the rental snow jackets and suits, looks more or less like beggars attire. Look for the Aldi Catalogue at the beginning of the winter. The sale lasts only one week and early bird catches the best ones. or along the Maroondah Hwy through Yarra Glen to Yea and then on to Mansfield. Via Whittlesea and Yea from Plenty road is the shortest. But the other routes have the speed advantage. For all official information about Mt. Buller visit. http://www.mtbuller.com.au . You can get the information about bus services, entry fee, hire rates etc. from this website. It is important that you should check the weather of the day from the same website. Don’t plan your trip on a rainy day, as that could make your driving miserable. Hiring a toboggan will make the kids happy and they cost only $10 a day. But the Mansfield rip-off may charge you up to $15. The above website provides almost all the information that you require for planning your trip. You may have to carry a wheel chain depending on the condition of the snow. Mt Buller’s wheel chain requirements are decided on a daily basis and are determined by weather forecasts and existing road conditions. Chain requirements may vary between 2-wheel drive (2WD) and 4-wheel drive (4WD) and All-wheel drive (AWD) vehicles, as each of these types of cars react differently to snow and icy road conditions. If you don’t want to drive three hours to be in snow, Lake Mountain is a closer alternative for Melbournians. Lake Mountain is only one hour drive from Melbourne. But you need to check the snow report before you go to Lake Mountain. Snow report can be availed from the website http://www.ski.com.au . Ensure that there is enough snow to give you a wonderful snow experience. I have never visited Lake mountain, so I won’t be able to provide more information on this. If any of you want to share your experiences; you may do it by emailing us at admin (at)india2australia.com . We will publish all sensible travel journals. That will help the future travellers to the region to avoid the pitfalls. How to plant a lemon tree ?